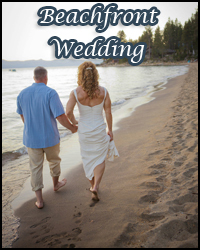 If you’re planning a wedding in Lake Tahoe you’re sure to find an abundance of beautiful wedding locations to choose from, all of which are conveniently located around the lake. Having ample choices in conjunction with the diversity of exquisite landscaping and unique characteristics each venue endorses, you are certain to easily find the perfect spot to host your wedding ceremony on your very special day. 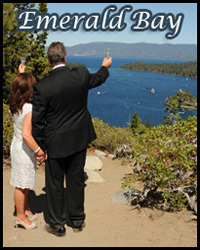 Many brides and grooms marry on the beaches and bluffs of Tahoe, and there are several popular wedding locations from which they often choose. However, with such an assortment of terrain and character each wedding venue provides, all of our sites have an indelible appeal. 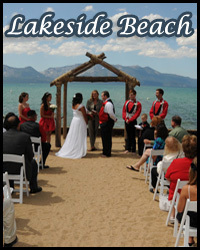 Below is a list of ceremony venues suitably located around South Lake Tahoe. Simply click on the location of choice for additional details and photos. When you’ve made your selection, give us a call or complete the information request form to book your specific date. For the bride and groom who want a wedding in the sand by the edge of the water, Lakeside Beach is a great wedding site with a fabulous view. Its convenient location near the state line of Nevada in South Lake Tahoe, California, provides easy access to the beach and nearby accommodations. Situated on a bluff towering 300 feet over one of the most beautiful lakes in the world is renowned Emerald Bay. 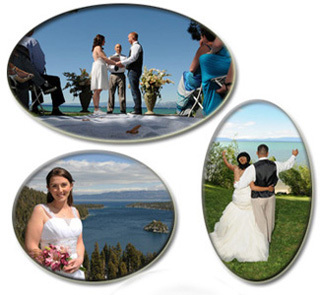 Located on the west shore off highway 89, this magnificent wedding venue provides panoramic scenic views as far as the eye can see and is one of Lake Tahoe’s premier wedding locations. 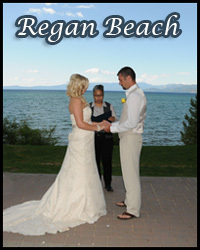 Centrally located in the heart of town, Regan Beach is a remarkable ceremony site that’s both convenient and beautiful. The spacious, park-like setting is elevated yet adjacent to the lake, providing exceptional views of Tahoe’s pristine, tri-colored water and the surrounding Sierra Nevada Mountain Range. 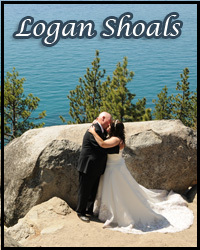 Of all Tahoe wedding locations throughout Lake Tahoe, Logan Shoals is one of the best for sunset weddings. Located on the east shore in Nevada approximately twelve miles from the California and Nevada border, the rocky bluff perched high over the lake offers a stunning backdrop for your ceremony. This lovely place is hidden away at the base of Echo Summit in the City of Meyers. The park is located on the banks of the Upper Truckee River adjacent to Lake Baron and is about eight miles from the central part of South Lake Tahoe. Offering a serene setting and splendorous views, it’s a perfect place to celebrate your special day. Simplicity and affordability without forgoing the attributable traits desired when choosing a ceremony site is a prime reason for marrying at our beachfront venue. Situated along the lake’s pristine shoreline, your Tahoe wedding will be conducted on the sand at the water’s edge where views of the aqua colored lake and lofty Sierra Nevada Mountains fill the background. 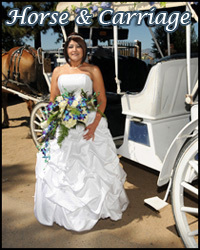 For the bride and groom who want to make a grand entrance on their wedding day, there’s no better way to do it then to arrive in your own personal carriage. Your private coach is drawn by a beautiful horse to a nearby lakeside resort where your exchange of vows will take place on a reserved beach at the edge of the water. 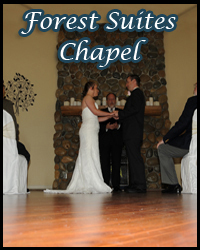 One of the pleasantest chapels in town that’s situated in the heart of South Lake Tahoe is the modish Forest Suites Chapel. This fabulous indoor location is available year-round and is a great alternative to outdoor wedding sites, especially during the frosty winter season the high Sierras are prone to. Travel an approximate two mile journey up the mountainside in a gondola at the world-famous Heavenly Mountain Ski Resort. 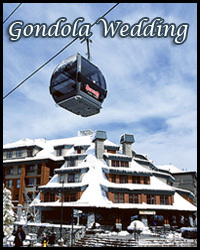 Your wedding is conducted at the gondola’s midway station on the observation deck at an altitude of over 9,000 feet that overlooks the entire south shore of Tahoe and surrounding areas. 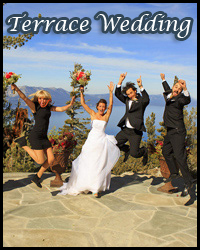 If looking for a fantastic view for your walk down the aisle of matrimony, one of the best you’ll find in Lake Tahoe is on the mountaintop terrace at world-famous Heavenly Mountain Resort. The setting is surrounded by startling splendor, and at heights of over 9,000 feet, the terrace provides shore to shore visions of Lake Tahoe as never seen before. 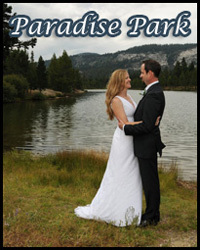 This prime beach venue in Nevada is an excellent choice for brides and grooms wanting a small and intimate wedding along the pristine shore of Lake Tahoe. 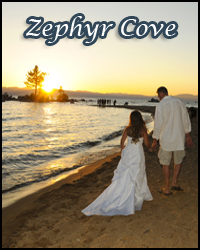 Dispersed with rocky configurations, the inlet at Zephyr Cove is a display of scenic beauty, perfect for a casual beach wedding in the sand. 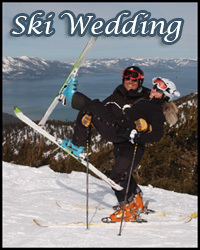 Have an adventure wedding on skis atop the Sierras at Heavenly Mountain Ski Resort. Our select premier spot where you’ll exchange wedding rings and vows offers the bride and groom superlative views with an unimaginable background that provides untouchable photo opportunities. Cross the snowy meadow in your horse-drawn sleigh to a predetermined area where your ceremony is performed in the frosty outdoors surrounded by mountains laden with snow. 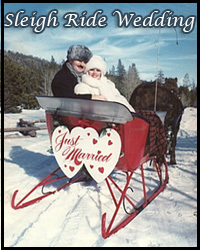 The charm and serenity of our sleigh ride venue will leave you with enduring memories of a special day in your life. For the courageous bride and groom wanting an untraditional and matchless way in which to join in matrimony, an adventure wedding may be an inciting way to do it. 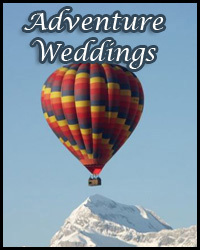 Perhaps considered a bizarre way to exchange wedding vows, soaring through the sky in a helicopter or afloat in a hot air balloon will irrefutably present an unrivaled wedding day experience. If you would like to book your wedding at any of the listed Tahoe wedding locations above, please give us a call toll free at (888) 896-4656. Our professional staff will be glad to assist you. If you prefer, you may also use our contact form to reserve your date online or to request additional information. It’s that easy.